Wow! This large mosaic wall mirror positively shines in the light. The blue, teal, aqua, and white color palette of this decorative mirror is sure to add a pop of color to any room in your home -- bathroom, living room, bedroom, etc. 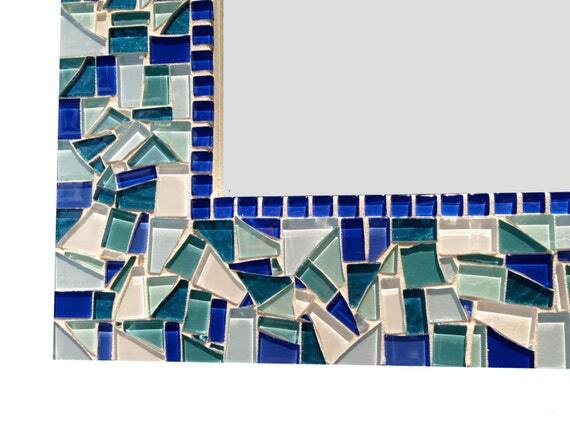 Some of the mosaic tiles have a metallic finish, while others are glass -- adding texture and depth to this wall decor. This teal and blue mirror has a modern, beach vibe. This is a made to order item. Please allow up to three weeks to create and ship.